Has God ever asked you to do something that absolutely terrified you? What keeps us from stepping out in faith? Fear is probably what causes most of us say, “I just can’t do that”. We prefer to do things that are safe, but playing it safe causes us to miss many blessings that God has to offer. The moment you step out in faith and trust God, He will provide strength. Philippians 4:13 says, “I can do all things through Him who gives me strength.” You CAN’T do it alone, but you CAN do whatever God calls you to do through His strength! What’s holding you back from being completely obedient to God? There are three things you should do before saying “no”. Trust – Place your trust in Him rather than your feelings. “Trust in the LORD with all your heart and lean not on your own understanding,” (Proverbs 3:5). Pray – Seek God’s direction – “In all your ways acknowledge him, and he shall direct your paths,” (Proverbs 3:6). Proceed – Go wherever God leads you and do whatever He requires. “For my thoughts are not your thoughts, nor are your ways my ways,” (Isaiah 55:8). I have to admit that God has asked me to do things that terrified me. And believe me when I say that there have been things I absolutely refused to do and later regretted. But when I’ve been obedient, things were much easier than I expected because God’s power was made perfect in my weakness. I also found those were the times that have brought some of the greatest blessings in my life. When God asks us to do something, it will often be out of our comfort zone. If we are confident in our own abilities, His power gets stifled by our confidence, and it becomes OUR project instead of HIS. But when we choose to allow Him to use us, despite our weaknesses, HIS power shines through instead of our own. When you make yourself available, you will be amazed at what God can do through you. 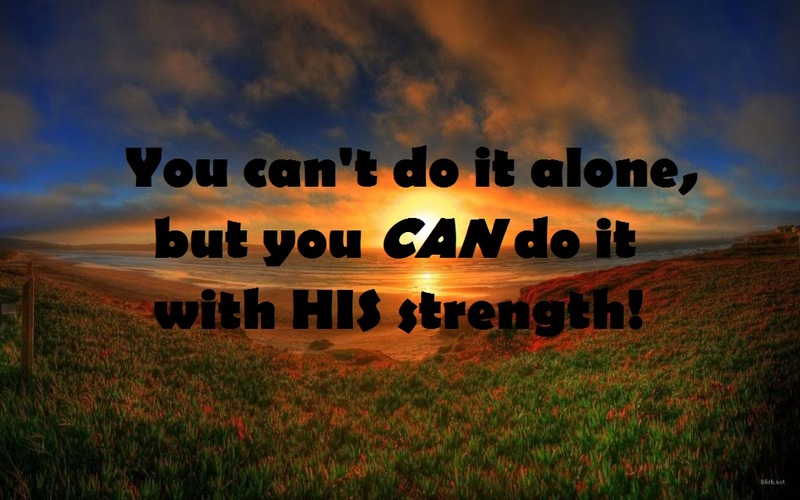 Through His strength, you CAN do it, so say “yes” with confidence in His power! The jitters that accompany doing things we are unfamiliar with often scare the wits out of us, and I know that feeling very well. Faith is much needed to take up such a challenge and to claim God’s promise of His enablement wherever He chooses to place us. Thank you for sharing this. God bless. Exactly and I have sure had the wits scared out of me a time or two! It sure is comforting to know that God is there during those times providing the strength I need. Thank you, Tresa, for the pep talk! You are so right about stepping out in faith and allowing God to work through us. We have no need to fear challenges and uncertainties. With our chins up we can face tomorrow–whatever it may bring. I KNOW these truths; I need to embrace them!